Master box-stacking architecture firm ODA has unveiled its latest addition to the Brooklyn cityscape: an eight story, mixed-used development at 71 White Street in East Williamsburg. 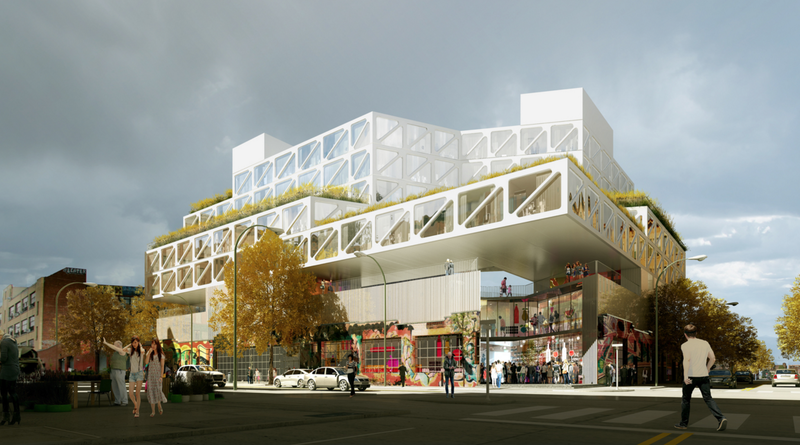 The approximately 80,700-square-foot hotel, retail, and semi-public space will rise from the skeleton of an existing one-story, graffiti-adorned 1930s warehouse. Calling 71 White Street a mall would undermine the grittiness it strives so hard to project. Yet, its circulation pattern and its relationship to the street speaks for itself. The complex’s stacked and rotated layers recede from, yet tower over, the existing low-slung street wall to create a series of insular private and public spaces. The main entrance, on the corner of McKibben and White streets, is set deep into the lot, drawing visitors though indoor and outdoor corridors to access food, drink, and entertainment. The first two floors are programmed for restaurant and retail space. Ground-floor windows would punctuate the now window-deficient facade, and create visual interest on the street. The top five floors are given over to a 112 room hotel. That hotel will provide de facto amenities: gym, rooftop bar, and pool. 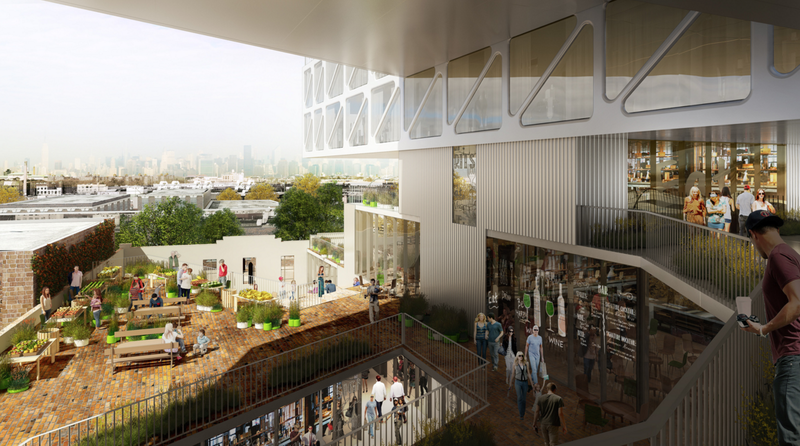 In addition, renderings depict multiple, expansive shared terraces that afford views of Manhattan. For those interested in people-watching, the third floor will be an open-air public promenade. To access the third floor space from the main entrance, a set of stairs slopes gently upward and diverges, giving access to the east and west ends of the structure. The circulation pattern will accommodate a range of uses: on the west end, an amphitheater slopes down to the ground floor, while the east end appears to be reserved for more quiet activities, like eating at picnic tables.